2009 Top Prospect List: "Other Notables"
Leading off the list of "other notables" is J.C. Sulbaran. He's the obvious choice, because he's hands down the most intriguing. The Reds selected Sulbaran in the 30th round of the 2008 draft. He was drafted out of American Heritage High School in Plantation Florida, which is the same school that produced top Royal prospect Eric Hosmer. 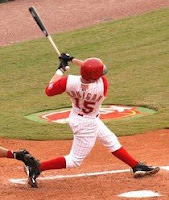 Sulbaran was set to attend the University of Florida, but the Reds were able to get him signed to a professional contract. Sulbaran works with three pitches: a 90-94 mph fastball, a very good biting curveball, and a changeup. At 6-2, he has good height for a pitcher. Even before throwing a professional pitch, there was already a bit of buzz surrounding Sulbaran. He managed to open some eyes with impressive performances on the international stage for the Dutch national team. Sulbaran put together two solid performances against the Cuban national team. As a young fresh out of high school pitcher, his performance was rather impressive. However, there just wasn't an established baseline of performance on which to base his evaluation, so he landed in the "Other Notables" category. However, if his subsequent performance in the World Baseball Classic is any indication, Sulbaran could climb into the top 10 on the 2010 list. In case you missed it, here is how Sulbaran dealt with Ivan Rodriguez during the WBC. Good morning, good afternoon, and good night, Pudge! I'm still higher on Janish than most. As I mentioned in the Chris Dickerson write up, I think the Reds should give extra weight to prospects who provide plus defense and plus strike zone control from premier defensive positions. Janish got a lengthy look at the MLB level in 2008 and looked a bit overmatched. He posted a meager slash line of .188/.270/.250/.520 in 89 plate appearances. He struck out in 22.5% of his at bats, but did fairly well when he put the ball in play, as he posted a 23.3% line drive rate and a rather unlucky .230 BABIP. Janish has a short, quick, compact swing and a good eye at the plate. The Reds want Janish to work to improve the strength in his forearms and wrists, which can only help him reduce his strikeouts and allow him to do more with the balls he puts into play. He'll never be a star, but I still believe he has the potential to be a sneaky good value at the shortstop position. Smith is an intriguing pitcher. The Reds selected him in the 6th round of the 2006 draft out of Community College of Southern Nevada. His pitching profile is good control, high contact, heavy ground ball pitcher. He's not a big strikeout pitcher, but he throws a heavy sinking fastball. In addition, he features a good slider and a mediocre changeup. In 2008, his stellar performance at high-A Sarasota earned him a promotion to double-A Chattanooga. Unfortunately, his stint at double-A didn't go quite as smoothly. His performance level wasn't very high, but later in the season it was revealed that Smith had been trying to pitch through torn cartilage in his knee. It'll be interesting to see just how big of a role the knee problem played in his 5.40 ERA. Obviously, ground ball pitchers are desirable in Great American Ballpark, but I'm not sure his ceiling is high enough to project him as a starter. It was a bit surprising to see Baseball America rate him as the 13th best prospect in the system. Ultimately, he may be better suited to the bullpen. Heisey is a well rounded prospect and a good example of how hard a prospect has to work to shed an early label. He has never been given respect by the scouting community, so he is constantly working to prove them wrong. He went to Messiah College in Pennsylvania and was selected by the Reds in the 17th round of the 2006 draft. Heisey has a career slash line of .291/.365/.433/.799. He doesn't have any tools that really stand out, but his drive to succeed and his baseball IQ cause them to play up a tick. His baseball IQ certainly helps him on the bases, as he swipes bases at a good clip. Ultimately, Heisey's best attribute is his plus defense. He has the ability to play all three spots in the outfield. However, on the offensive side Heisey still projects best as a 4th outfielder. Unfortunately, he has a heavy platoon split, which as a right-handed hitter leaves him on the short side of the platoon. In his minor league career, he has a .913 OPS against lefthanded pitchers and a .779 OPS against righthanded pitchers. In addition, Heisey's line drive rate leaves something to be desired. As you can see from the following video-clip, Heisey utilizes a simple, compact swing that has served him well. However, he'll only go as far as it will take him. At this point, it remains to be seen if he has enough offensive upside to be more than a utility outfielder at the MLB level. Hanigan is a solid professional. Surprisingly enough, he was signed by the Reds as an undrafted free agent. He doesn't have many true weaknesses, but he also doesn't have any major strengths. Perhaps his most valuable attribute is his ability to control the strike zone. Not only does he post a strong walk rate, but his high contact rate allows him to post good batting averages. Hanigan also possesses a solid defensive skill set, which should ensure that he'll have an MLB career of some kind. Catchers with good defensive skills don't have to provide much offense to justify an MLB roster slot. Unfortunately, he's already 28 years old, so there isn't much upside left. At this point, what you see is what you get with Hanigan. And, obviously, the Reds aren't convinced that he can shoulder a big role. After trading for Ramon Hernandez to be the number one catcher, the Reds seem to have penciled Hanigan in as the backup catcher for the next few years. Well, in the interests of full disclosure, I suppose I need to talk about Josh Ravin's less than stellar second game after talking about his impressive debut. Ravin certainly got his 2009 season off on the right foot. Unfortunately, he didn't fare quite as well in his second start. On Thursday, Ravin toed the rubber to face off against the Fort Wayne Tin Caps, which is the San Diego Padre's low-A affiliate. In the first inning, Ravin looked ready to build off his strong debut performance. set the Tin Caps down in order with a swinging strikeout, a fly out to center, and a line out to the second baseman. In the second, his control problem began to rear its ugly head. He walked the leadoff hitter. After getting a flyout to center, he uncorked a wild pitch to advance the runner to second, but quickly made that irrelevant by serving up a two-run homer to clear the bases. On a positive note, Ravin regrouped to get a called and swinging strikeout to get out of the inning. The worst was yet to come. Ravin took the mound for the third inning and quickly found trouble. He hit the first batter and walked the second. He almost escaped the trouble by getting a groundout and a pop up, but he followed those positives outcomes by giving up a two singles and a walk before closing out the Tin Caps with a strikeout. Ravin came back out for the 4th and got back on track. He set the Tin Caps down in order with a ground out, strike out, and a fly out. It was nice to see him finish out strong, so there were some positives mixed in among the negatives. I listened to most of the game and it sounded like Ravin's problems stemmed from an inability to command his breaking ball. Since he couldn't get the breaking ball over for strikes, the Tin Caps simply waited for him to throw the fastball in the zone. When all was said and done, Ravin worked 4.0 innings giving up 3 hits, 1 homer, 4 runs, 3 walks, 1 hit batter, 1 Wild Pitch, and 5 strikeouts. Certainly not the worst outing, but the fact that his problems were control driven is of concern. Still, the strikeouts and his ability to regroup were positives to be taken from his performance. It'll be interesting to see what the next few starts hold for Ravin. Anyway, it seemed only right to mention his struggles in his second start after his success in the first start. Now we can get back to non-Josh Ravin programming. Josh Ravin had a horrendous season in 2008. A season which caused his prospect status to drop precipitously, to the point where he is no longer even considered to be a prospect by some. However, in what may be a sign that he has put his nightmare 2008 season behind him, Ravin went out and performed admirably in his debut performance for the Dayton Dragons. On April 10th, Ravin took the mound against the Great Lakes Loons. He pitched 6.0 strong innings in which he gave up 3 hits, issued only 1 walk, struck out 3 hitters, and gave up 0 runs. In addition to the impressive control, Ravin also flashed strong groundball tendencies, as evidenced by his 10/3 GB/FB ratio. The most obvious thing that jumps out about his performance is the lack of walks. His control is what has plagued him thus far in his professional career, so this is very positive outing for him. In addition, Ravin managed this feat against a stellar opponent. The Great Lakes Loons are an affiliate of the Dodgers and their 2009 roster contains 11 of the top 30 Dodger prospects. And, as you can see from the game photo of Ravin, he still has strong mechanics. He exhibits good balance, strong arm and ball position, and a good stride and drive off the rubber. It's obviously just one start, but every journey begins with a single step. Let's hope Ravin has taken the first step on the road back to blue chip prospect status. Here is how Marc Katz of the Dayton Daily News wrote it up. Pitches six scoreless innings, giving up three hits and a walk; gets help in four-run fifth. DAYTON — Worried they might lose their low Class A team in Midland, Mich., to another organization, the Dodgers stacked Great Lakes with a third of their best prospects and told the Loons to go out and win. On opening night Thursday, April 9, they clobbered the Dragons. Ravin, a self-described “disaster” last summer, went six scoreless innings, allowing three hits and a walk while his teammates backed him with a four-run fifth on the way to a 6-1 victory Friday at chilly Fifth Third Field. When Devaris Gordon led off with a bloop single to left, then stole second, Ravin was in trouble at the top of the game. Only Ravin nailed Gordon at second, stabbing a hard grounder and catching the runner too far off the bag. Catcher Jordan Wideman recorded the second out on a steal attempt and Jaime Pedroza struck out. Ravin was on his way. Great Lakes spent two losing seasons with the Dodgers, who promised a more promising lineup if the Loons would re-sign for two more years. It happened, and 11 of the organization’s Top 30 prospects — even eight who played at a higher level last season — were shipped to Midland. Thursday, the Loons busted Dayton 14-3. Four Dragons collected two hits, including center fielder Dave Sappelt for the second straight night. The Dragons and Loons finish the series tonight with 2008’s National High School Player of the Year Ethan Martin making his pro debut for Great Lakes. 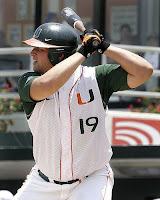 With the 7th overall pick in the 2008 amateur draft the Cincinnati Reds selected University of Miami first baseman Yonder Alonso. It was a surprising selection, but it's turning out to be an impressive one. It wasn't surprising because Yonder was in any way undeserving of such a high pick, but rather because the Reds already had an impressive young first baseman at the MLB level. But, the Reds went with the best player available. Yonder was also one of the safest selections in the draft, as there really aren't any questions about his game at all. He is a very polished hitter who plays a defensive position that isn't very challenging, which in the final analysis means he doesn't require much development time. The obvious question when the Reds drafted Yonder was what were they going to do with him. He is a very good hitting prospect, but won't require much time in the minors and is blocked at the MLB level by Joey Votto. He truly was one of the elite hitters in all of collegiate baseball and certainly the most disciplined and polished. 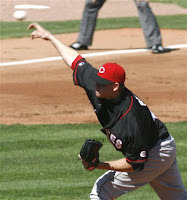 After he was signed, the Reds sent Yonder to high-A Sarasota to finish out the 2008 season. He only got in 25 plate appearances, but demonstrated that he was overqualified for the level. He posted a slash line of .316/.440/.368/.808 with a 5/5 K/BB ratio. His power didn't emerge, but Sarasota is a challenging environment for hitters so the lack of homeruns isn't of concern, especially in light of his 33% line drive rate. 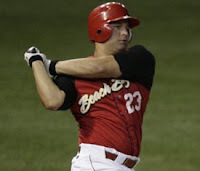 In addition, the Reds sent Alonso to get some playing time with the Waikiki Beach Boys in the Hawaiian Winter leagues. Given his advanced hitting skills, the Reds will likely send Yonder to double-A Carolina to start the 2009 season and promote him up the ladder very quickly. Alonso is a large individual with an odd body type. He's very thick and barrel chested, but he isn't at all out-of-shape or overweight. He's just big and rather slow. However, while he has below average speed, he actually does seems to have pretty good agility. In addition, he has an average arm and should be able to handle most balls that he can reach. Unfortunately, Alonso is only an average defensive first baseman and his skill set precludes a move up the defensive spectrum to a more challenging position. The problem is that he is likely to get worse as he ages and his body continues to fill out. His body type and skill set don't leave much margin for error on defense, so if he loses any agility or foot speed, then he'll immediately become a DH in a non-DH league. When you start out at the bottom of the defensive spectrum, there isn't anywhere to go but DH. In addition, when you spend a high draft pick on a player from the bottom of the spectrum, then you are clearly drafting him for his bat. Fortunately, Yonder brings a great deal to the table offensively. Yonder is patient. Very patient. He waits for a pitch he likes and makes sure that he doesn't miss it when he gets it. His pitch recognition is very strong, as indicated by his remarkably strong K/BB ratio. In addition, he has very good hand-eye coordination, which enables him to make consistent, hard contact. While waiting for the pitch, Yonder holds his hands a bit higher than most, as his hand position is actually up behind his left ear. This position results in the bat being essentially horizontal to the ground, rather than pointing to the sky like most hitters. When coupled with his higher hand position, Yonder's stride towards home plate makes him more comfortable driving pitches that are middle away. When a hitter steps towards homeplate to close up his stance, it's often possible for a pitcher to be successful working in on the hands. In addition, Yonder's hand position adds a bit of length to his swing as he has to bring his hands down and back to get into hitting position, which can make him slower to inside pitches. Given his offensive abilities, it shouldn't be too difficult for the Reds to shorten his swing path to the inside pitches, which will help unlock his pull power. Regardless, his bat speed and slight uppercut swing generate substantial power. Overall, Yonder's combination of power and patience was almost unrivaled in the 2008 draft. You can access his draft video here. In addition, here is a video clip of a long Yonder at bat. Not surprisingly, in the at bat he sees a lot of pitches (6) and ends up hitting a long drive to left-centerfield. All in all, it seems to be a very typical at bat for Yonder Alonso and one that will likely be repeated at the MLB level for years to come. Yonder has the potential to be one of the rarest of the rare. He could be a late count hitter who draws a ton of walks and strikes out very infrequently. Typically, the two go hand-in-hand, but there are a select few who can work deep into counts while managing to avoid strikeouts. They don't come around very often, especially those who can also drive the ball out of the ballpark, but at the University of Miami Yonder walked 172 times and struck out only 103 times. His ability to control the strike zone, make consistent contact, and drive the ball with power make him a very complete hitter. It'll be interesting to see how the Reds handle the 1b conundrum. Reading the organizational tea leaves leads me to believe that they will shift Joey Votto to left and play Yonder at first. However, I'd rather see them follow the Brewers course of action with Matt LaPorta and trade one of them for value that better addresses the needs of the organization. Regardless of how they choose to use the value of Yonder Alonso, it's quite clear that he has a lot of it. Yonder's blend of offensive skills and polish makes him a high ceiling prospect with very little downside risk. That combination earns him the #1 spot on the list. Signing Gary Sheffield to play leftfield at the expense of Chris Dickerson would be the absolute dumbest thing the Reds could possibly do.